The village Aruj (Արուճ, former Talish, XVIII c till 1970) is one of the oldest settlements of Armenia. It is situated in historical Aragatsotn province, at the southern foot of Aragats mountain near Ashtarak. It is mentioned as winter shelter for the king’s army in V c. It was the capital city of Armenia during Ishkhan Grigor Mamikonyan’s power (661-682). It became a town-settlement in X-XI cc. Aruj and its environs are rich with historical- architectural monuments; burial-vaults from Bronze Age, temples, palaces, fortresses, khachkars, etc. 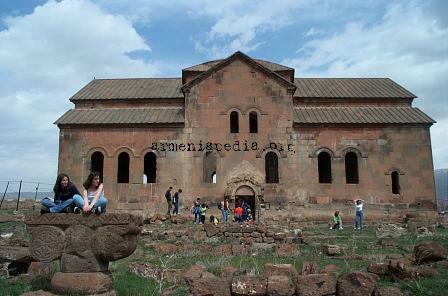 The temple of Arutch is one of the most important medieval Armenian architectural constructions. According to building inscriptions and manuscripts (Ghevond, Hovanes Draskhanakertsi, Stepanos Taronatsi) in 60-70’s of VII c it was built by Grigor Mamikonyan and his wife Heghine. It belongs to the "domed hall" type of churches (Ptghni, Ddmashen). Inside the big church’s (17,0x34,6) praying hall, by the longitudinal walls, over the two arches connecting the pillars, the dome with its drum raised (now destroyed). Thanks to such order of the bearings the praying hall is taken as a united, unseparated territory; the big altar is well visible from all sides by which the sacristies are placed. There are two deep and wide bays in the eastern wall. Between them under the window, a building inscription is placed. The windows are decorated with beautifully ornamented arches, the cornices are carved as if they are woven like those in Zvartnots. The walls of the temple are plastered and decorated with frescos (now seriously damaged). In the dome of big altar, about 7 m high, Christ is pictured with a parchment [whistle?] in his left hand. The pedestal is divided into two parts: acanthus leaves with roses and fruits (grape, pomegranate) that make a decorative belt, along the entire wall of big altar. Under the pedestal its painters name, Stepanos is mentioned. The temple of Aruj with its solemn and huge dimensions, architectural impressive ways, rules around itself[?]. This half-destroyed monument was essentially restored (except the dome) in 1949-1950. The palace, according to manuscripts also built by Grigor Mamikonyan, during 1948-1951 excavations was found near the temple, on the southwestern side. The early medieval secular architecture of this interesting monument-complex consists two buildings. One of them in the southern side of temple had a vaulted hall, similar to Dvin’s catholicity by its scheme and other details. The bottom parts of the walls, the anchors of the pillars and two capitals preserved from the palace. Another building, situated a little to southeast (which has a one-nave basilica church) has a different foundation. Its rectangle hall was vaulted and leaned on four pillars. Later on, probably in late medieval times, they added thick walls and built a swimming pool that filled up through an underground river. The half-destroyed building was used for defensive purposes. Aruj’s fortress (has not been professionally examined yet), the remainders of ramparts and buildings are preserved on the eastern outskirts of the village. 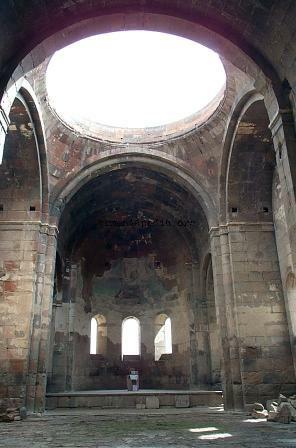 The half-destroyed caravansary is preserved on the northern side of the village, on the Ashtarak-Talin highway. It belongs to the three-nave caravansari type with one hall, that were built in Armenia in XIII-XIV cc. The six-pillared hall (15,0x26,5 m) was divided into central (6,0 m) and side (3,6 m) naves and were covered with 3 cylindrical parallel arches. As can be seen from the remainders of northern wall, the wide walls from the inside had pillars. The bearings took their role and the arched bays leaned on them. For the vaulted arches of middle nave similar bearings were connected to the longitudinal arches, a little above the pylons. The caravansary’s outward architectural was solved with safe inaccessibility, as the caravans that settled down here, were attacked and robbed. The outward walls were windowless, the corners and the center were built half-rounded in a pyramids scheme, which gave the erection a tower’s appearance. The only entrance was probably from the south, and the top roofing of the dome lightened the hall. Only the western corner of the caravansaries cover was preserved, and was repaired in 1960. This page was last edited on 14 October 2010, at 17:42.